Read on, for our experience @ Bereket. 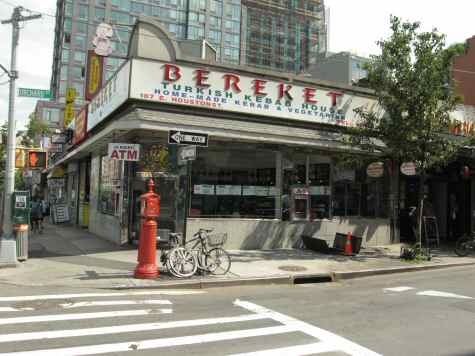 Bereket has become synonymous with the Doner Kebab in the East Village. Ah, so you’re not familiar with the Doner Kebab. Not to worry, sweetie! 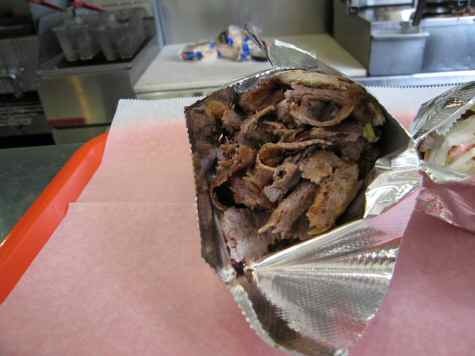 Doner Kebab is Middle Eastern fast food made from meat cooked on a vertical rotating spit (see picture below). So it’s hardly surprising that during my visit to Bereket I first asked for Doner Kebab Sandwich ($6.50). Since I’m always game for Falafel, I included Falafel Sandwich ($4) as well. Tempted as I was by the many Turkish sweets in the glass case near the cash counter, I completed my order with a Kadayif ($3.50). It took about six-minutes for my Doner Kebab to be ready. 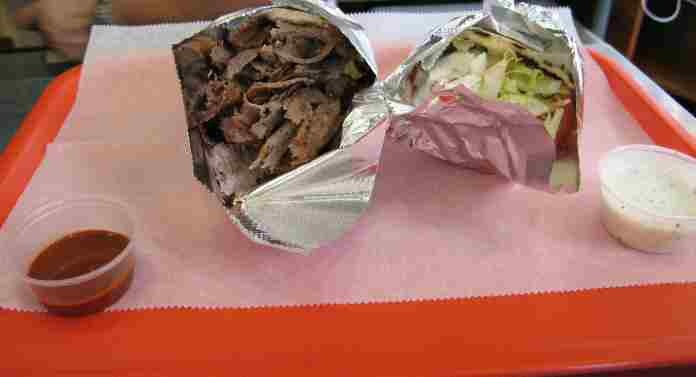 My Doner Kebab Sandwich came with grilled lamb, tomato, lettuce and onion stuffed in a Pita bread. One bite into the Doner Kebab and I was all smiles. I was overwhelmed by the sheer flavor of the sandwich. You can eat it as you would any sandwich or ‘fork out’ a few pieces of the meat into your mouth. Either way, you’re the winner. The grilled lamb shavings were delicious and I added some hot sauce on top while eating it. 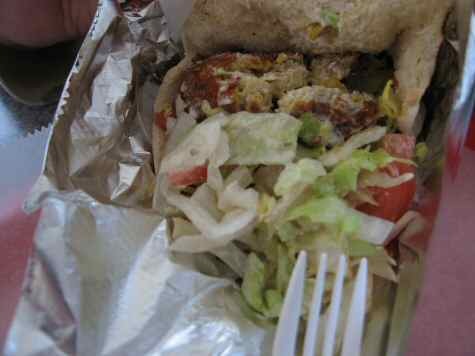 Bereket Falafel Sandwich came with three Falafel balls, lettuce, tomato and onion with pita bread. Alas, the Falafel Sandwich turned out to be a complete disappointment. The Falafel balls were not crisp, not even lukewarm and the Pita bread had a slightly burnt flavor and bitter taste. Needless to say that I did not enjoy it one bit. Truth be said, it was one of the worst Falafel Sandwiches I have had. No patch on the Falafel Sandwich at Taim or Mamoun’s. 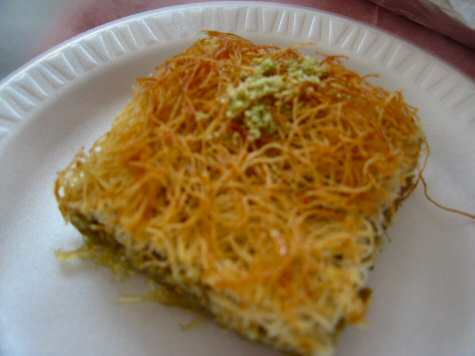 Kadayif is a bambino cake with honey and pistachio. No issues on the taste part. Though my sweet tooth relished the Kadayaif I consider it pricey at $3.50 for such a small piece. Bereket has no ambiance to speak of. As you enter Bereket, you have a trash can to the right of the main door, a few tables in the middle, food/cash counter at the rear right and rest room in the left corner. The tables were a little dirty during my visit. You walk up to the counter and place your order (menu posted on the wall above cash counter), pay for it and wait at a table for your food. Bereket accepts only cash. I did not get a receipt for my payment. I was also not pleased that the second waiter who walked in, picked up some stuff sitting on the trash can and dumped it into the bin and straight got behind the food counter without washing his hands. By the way, Bereket is open 24-hours.